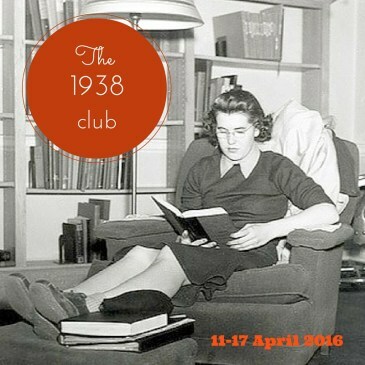 I'm so glad that Simon from Stuck In A Book & Karen from Kaggsy's Bookish Rambles enjoyed organising the 1924 Club because they've now decided to host another week focussing on another year - 1938. I've read quite a lot of books published that year, mostly pre-blog. Rebecca by Daphne Du Maurier, Three Guineas by Virginia Woolf, The Buccaneers by Edith Wharton, Miss Pettigrew Lives for a Day by Winifred Watson, Appointment with Death & Hercule Poirot's Christmas by Agatha Christie, Artists in Crime & Death in a White Tie by Ngaio Marsh, The Fashion in Shrouds by Margery Allingham, Nightingale Wood by Stella Gibbons, The Sword in the Stone by T H White, Miss Bun, the Baker's Daughter by D E Stevenson, The Citadel by A J Cronin. I enjoyed them all & maybe, if you'd like to join the Club, you might find some ideas from that list on what to read. I do have a few reviews on the blog for 1938 books & I'll re-post those reviews during the week of the Club, which is from April 11th-17th. I also have this little pile from the tbr shelves which all look very tempting. Will I finally read another Angela Thirkell? If the new reprint of Howard Spring's My Son, My Son, is released early (it's due to be published on April 7th), I may be able to read that as I've preordered it. I'll keep trawling the shelves & see if anything else jumps out at me. I should also check my eBooks. I know I have National Provincial by Lettice Cooper, Four-part Setting by Ann Bridge & Knock, Murderer, Knock! by Harriet Rutland & there may be others. It sounds like a lot of fun. I enjoyed reading the reviews from the 1924 Club & I'm sure I'll find books I want to read this time around as well. I have a month to get organized & make a decision - I can't possible dither for too much longer, can I? What a fun concept! I'll be looking at these links, thanks Lyn. At least I have lots on the tbr shelves so won't be tempted to buy anything! Thanks for all the suggestions! I was searching Goodreads and the Internet because I couldn't find a single unread book on my shelves from 1938! But I've place an ILL request for Miss Bun and my library also has the Georgette Heyer, in case Miss Bun doesn't arrive in time. Looking forward to it! I listened to the audio of Miss Bun & really enjoyed it. I read all the Heyer mysteries about 30 years ago so they're like new books to me now. I'm tempted by one of the mysteries at the moment. So many tempting titles on this list! I'm going to go with Our Town by Thornton Wilder, though, because it fits perfectly into my Reading New England challenge (April is the month for poetry and drama). I can't wait to see what everybody else reads. A book that spans two challenges is a good thing! I'd like to read the Thornton one day, I've never read him. What a wonderful list of possibilities. I have National Provincial, but as I already have books by Kate O'Brien and Margaret Kennedy lined up I may not have time for it. There are just too many choices for 1938! I do want to get to KMK, I'm a fan of the Dean Street reprints. Decisions, decisions! I think I'm going to join in. I've read quite a lot of the books that you have already, I'll have to check my shelves for other possibilities. It's a very tempting year, isn't it? Thanks for spreading the word, Lyn! What a wonderful selection of 1938 titles you've already read, and have got lined up to read. Wonderful stuff! I've started listening to the audio of Ruined City by Nevil Shute as well so I should have a few reviews organised by April 11.